Your heart rather sinks when you hear another restaurant has opened in “restaurant death row” opposite the Scottish Office on Commercial Street, Leith. With the exception of the Kitchin and Daniel’s restaurant who have successfully dug their heals in, many restaurants have opened and soon closed. Following a wonderful dinner last night, I am sure Chop Chop will be an exception. Fans already note the Haymarket location as their favourite restaurant in Edinburgh, and judging the number of people on a Wednesday night, they are flocking to Leith too. I have to declare, this is the first time I have eaten out at Chinese restaurant in many, many years as I have an aversion to MSG used liberally in many restaurants. The chance to celebrate Social Media day encourage me and Mr EF to go along. The group celebrating were served the Unlimited Banquet. Rather than read the menu in advance, we decided to “go with the flow” and find out more as the dishes arrived. Do check out the full menu, a real bargain at £18.50 per person. The flavours of the dishes were fresh and completely different from the standard Chinese menu. 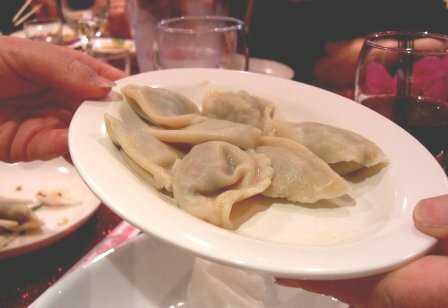 The unprepossessing boiled dumplings pictured were stuffed with pork and coriander, beautifully moist and delicate. Other particular favourites were the fresh salads; gloriously sticky sweet and sour pork ribs; the spinach and peanuts; the crispy northern beef and the aubergines with garlic. Those on other tables whose eyes were bigger than their stomachs ordered more in the (short) interval and struggled to finish. We were more restrained but by the time the last item came, we definitely felt satiated. If you’ve been put off by the fact that the Haymarket restaurant featured on Gordon Ramsay’s F-Word Best Restaurant (Series 5, episode 4) , don’t be. Book that table today. Currently, the restaurant is BYOB (you can buy beer) so don’t forget to take along your own bottle. There are some opening offers well worth checking out.